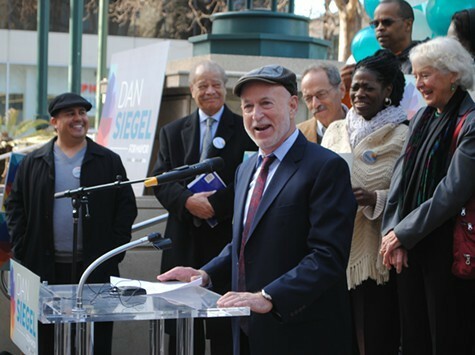 Civil rights attorney Dan Siegel laid out a distinctively progressive platform as he formally announced his candidacy for mayor of Oakland today. Standing at what was once the main entrance to the Occupy Oakland encampment nearly three years ago, Siegel said his campaign aims to make the city safe — not by adding additional cops, but through economic equality, social justice, education, and public privacy. Civil rights attorney Dan Siegel announces his candidacy for mayor. He is the fourth announced candidate to enter race to unseat Quan this November. Port of Oakland Commissioner Bryan Parker, university professor Joe Tuman, and Councilmember Libby Schaaf entered the race in recent months with platforms primarily focused on public safety and additional police officers. But none, thus far, have offered the type of red meat progressive stances put forward Thursday by Siegel.